Some people say it’s too early in the year to be thinking of lawn-watering strategies. However, for homeowners concerned about water conservation who still like to see green lawns and lush gardens, they never stop thinking about lawn-watering strategies. A series of products Shepco Warehouse Services (a division of Borderline Systems Niagara Inc.) carries in our St. Catharines warehouse includes timers and irrigation products to make lawn watering simple, non-wasteful and economical. The company that makes all the great irrigation equipment, along with lots of other great stuff, is called Orbit – have you met Orbit? Our team at Shepco would love to introduce them to you! With facilities worldwide, Orbit is the world leader in manufacturing and supplying irrigation, misting, and home-improvement products to homeowners in 40 countries across five continents. The company is well known for its manufacturing processes; product development and design; skilled engineering resources, and state-of-the-art injection-moulding facilities. For homeowners, though, the name “Orbit” best conjures up the image of a green lawn and a lush garden, safely and economically watered via an underground irrigation system, set to operate at off-peak times via a wifi-enabled timer. If that’s what you see when you think of Orbit, it’s because the company produces top-of-the-line, easy-to-operate underground irrigation products, including sprinkler systems, timers (even wifi-enabled ones like the B-Hyve), tools and more; drip irrigation systems and accessories; hose-watering handhelds and other tools, such as snowshovels (because no matter where you live, sometimes, winter happens). Mist cooling equipment is also available under the Orbit name, with personal-sized misters, kits to cover larger areas and all the parts homeowners will need to customize them. Mostly, Orbit’s great reputation comes from taking care of your great outdoors … but the company’s line of thermostat products brings innovative function to something every home contains. Available in both programmable and non-programmable versions, the Orbit home thermostat will help customers easily save money by controlling their home’s heating and cooling systems – like energy conservation at your fingertips. We can’t forget the company’s landscape lighting systems, either. Homeowners love the Orbit energy-efficient garden and pathway lighting, timers and motion-sensor equipment, too. Our teams at Shepco know people are thinking about their landscaping in winter, because we are filling orders for the Orbit products we warehouse. Ecommerce options have never been greater, and our purpose at the Shepco Warehouse is to successfully fill orders for all the products our partner retailers provide, from show shovels, to irrigation systems, to landscape lighting systems and so much more. 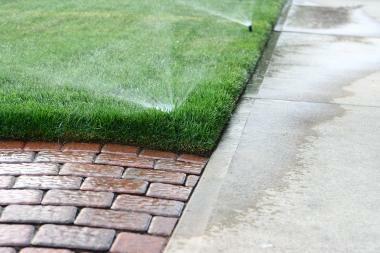 So, even though it’s only February, maybe it’s time to start thinking about those lawn-watering strategies? Planning your economical irrigation system just got a whole lot easier, because you and Orbit – well, you’re pals now. To learn more about Orbit and the company’s line of helpful home-care products, visit the website Orbitonline.com. Want to know more about Borderline’s warehousing, packaging and fulfillment systems? Reach us by phone at 905-687-4014, or send us a message via the contact page HERE. We’re Shepco Warehouse Services, a division of Borderline Systems Niagara Inc. … keeping our customers, and their customers, happy since 1956.